In order to respond to changes in their immediate environment, cells must be able to receive and process signals that originate outside their borders. Individual cells often receive many signals simultaneously, and they then integrate this into a unified action plan. But cells aren’t just targets. : they also send out messages to other cells both near and far. Most cell signals are chemical in nature. For example, prokaryotic organisms have sensors that detect nutrients and help them navigate toward food sources. In multicellular organisms, chemical signals include growth factors, hormones, neurotransmitters, and extracellular matrix components. These substances can exert their effects locally, or they might travel over long distances. For instance, neurotransmitters are a class of short-range signaling molecules that travel across the tiny spaces between adjacent neurons or between neurons and muscle cells. Other signaling molecules must move much further to reach their targets. One example is the follicle-stimulating hormone, which travels from the mammalian brain to the ovary, where it triggers egg release. Some cells also respond to mechanical stimuli. For example, sensory cells in the skin respond to the pressure of touch, whereas similar cells in the ear react to the movement of sound waves. In addition, specialized cells in the human vascular system detect changes in blood pressure – information that the body uses to maintain a consistent cardiac load. Cells have proteins called ‘receptors’ that bind to signaling molecules and initiate a physiological response. Different receptors are specific to different molecules. For example, dopamine receptors bind dopamine, insulin receptors bind insulin, and nerve growth factor receptors bind nerve growth factor, and so on. In fact, there are hundreds of receptor types found in cells, and varying cell types have different populations of receptors. Receptors can also respond directly to light or pressure, which makes cells sensitive to events in the atmosphere. Receptors are generally trans-membrane proteins which bind to signaling molecules outside the cell. Subsequently, they transmit signals through a sequence of molecular switches to internal signaling pathways. Membrane receptors fall into three major classes: G-protein-coupled receptors, ion channel receptors, and enzyme-linked receptors. The names of these receptor classes refer to the mechanism by which the receptors transform external signals into internal ones – via protein action, ion channel opening, or enzyme activation, respectively. Because membrane receptors interact with both extracellular signals and molecules within the cell, they permit signaling molecules to affect cell function without actually entering the cell. This is important because most signaling molecules are either too big or too charged to cross a cell’s plasma membrane. Not all receptors exist on the exterior of the cell. Some exist deep inside the cell, or even in the nucleus. These receptors typically bind to molecules that can pass through the plasma membrane, such as gases like nitrous oxide and steroid hormones like estrogen. Once a receptor protein receives a signal, it undergoes a conformational change, which in turn launches a series of biochemical reactions within the cell. These intracellular signaling pathways, also called signal transduction cascades, typically amplify the message, producing multiple intracellular signals for every one receptor that is bound. Activation of receptors can trigger the synthesis of small molecules called second messengers, which initiate and coordinate intracellular signaling pathways. For example, cyclic AMP (cAMP) is a common second messenger involved in signal transduction cascades. cAMP is synthesized from ATP by the enzyme adenylyl cyclase, which resides in the cell membrane. The activation of adenylyl cyclase can result in the manufacture of hundreds or even thousands of cAMP molecules. These cAMP molecules activate the enzyme protein kinase A (PKA), which then phosphorylates multiple protein substrates by attaching phosphate groups to them. Each step in the cascade further amplifies the initial signal, and the phosphorylation reactions mediate both short- and long-term responses in the cell. cAMP stops signaling when it is degraded by the enzyme phosphodiesterase. Other examples of second messengers include diacylglycerol (DAG) and inositol 1,4,5-triphosphate (IP3), which are both produced by the enzyme phospholipase, also a membrane protein. IP3 causes the release of Ca2+ (another second messenger) from intracellular stores. Together, DAG and Ca2+ activate another enzyme called protein kinase C (PKC). Protein kinases, such as PKA and PKC, catalyze the transfer of phosphate groups from ATP molecules to protein molecules. Within proteins, the amino acids serine, threonine, and tyrosine are common sites for phosphorylation. 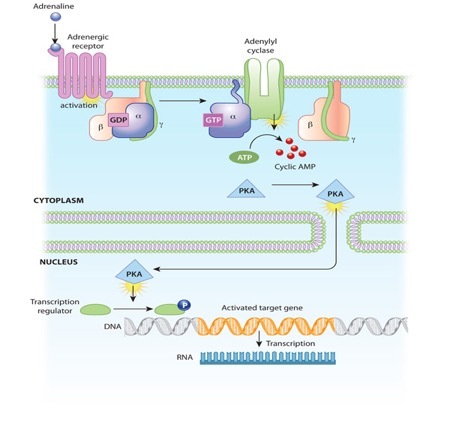 These phosphorylation reactions control the activity of many of the enzymes involved in intracellular signaling pathways. Specifically, the addition of phosphate groups causes a conformational change in the enzymes, which can either activate or inhibit the enzyme activity. Then, when appropriate, protein phosphatases remove the phosphate groups from the enzymes, thereby reversing the effect on enzymatic activity. Phosphorylation allows for intricate control of protein function. Phosphate groups can be added to multiple sites in a single protein, and a single protein may, in turn, be the substrate for multiple kinases and phosphatases. At any one time, a cell is receiving and responding to numerous signals, and multiple signal transduction pathways are operating in its cytoplasm. Many points of intersection exist among these pathways. For instance, a single second messenger or protein kinase might play a role in more than one pathway. Through this network of signaling pathways, the cell is constantly integrating all the information it receives from its external environment.